The second reincarnation of Desperation A.M. came about in 2011 when The Axidents split down the middle. Vocalist Deek and drummer Baz had been gigging more regularly with their other band, Sad Society, who appealed to the 'punk's not dead' faction of Edinburgh's underground gig circuit, while Mark and Ross recruited drummer Stephen 'Chaz' Watt, who, like themselves, had more eclectic tastes. As a trio Desperation A.M. headed down the 'post punk' route, penning a set of songs influenced by Devo, Gang of Four, Pixies and Punishment of Luxury among many others. The expansive nature of their repertoire was illustrated by their choice of cover material which included Brian Eno's 'Baby's On Fire' and 'Maximum Accelaration' by Ultravox. In 2013 they were joined by Paul Mackie on keyboards and violin. Paul had previously experienced considerable success - with appearances on Top of The Pops and OGWT as well as support slots to U2 - with Edinburgh's renowned punk/pop act Scars in the late 1970s. Their poetic, Bowie-influenced take on 1977's exploding punk scene, underscored by Mackie's monumentally deft fretwork, propelled them way ahead of the three-chord flock. Mackie's fluent violin patterns and classically-trained keyboard lines were perfect for Desperation A.M. but the demands of his day job made it difficult to commit to anything long-term. They recorded one album, 'Choice', before Mark, Ross and Chaz reinvented themselves as Noniconic. After the demise of 4 Minute Warning Shug, Ross and Mark continued as a three-piece, the latter two sharing vocal duties. Distancing themselves from their former band's politics they briefly altered the name to Radiate Away. A lad happened to be visiting a band in a neighbouring practice room in the Regent, the derelict cinema in Abbeyhill converted to practice rooms. He enquired if they were looking for a lead singer. Little debate was required beyond an impressive audition of Joy Division's 'Transmission' and Dave 'Looby' Sherry, hailing from Ayr, proved an apt successor to Toby. Consolidating the new line-up they decided on a further name change. Musically indebted to Gang of Four they considered the lyric "woke up this morning desperation a.m." from that band's debut E.P. Damaged Goods and decided on Desperation A.M. Just as the Leeds postpunkers melded Wilko Johnson-esque guitar chops with funk basslines, Desperation A.M. abandoned power chords for staccato guitar jabs and seriously funkadelic rhythms. They were also experimenting with guitar pedals - Shug, a Ferranti's technician, would actually construct his own and bring them in. 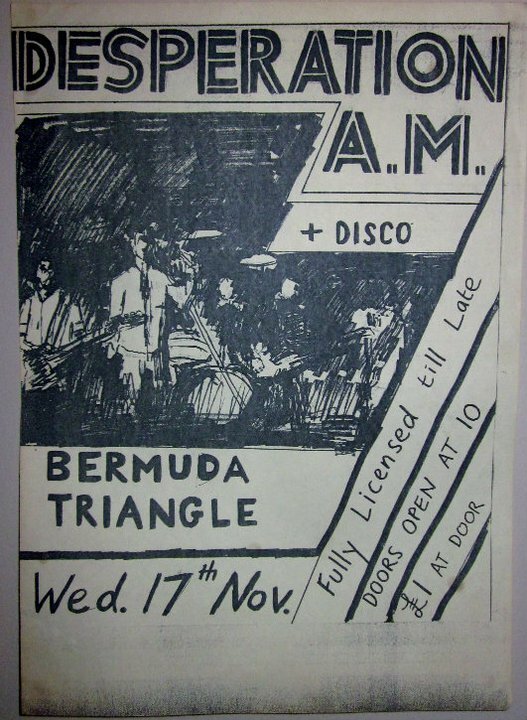 Playing an upbeat set of post-punk sliced up by funk and covering the aforementioned Joy Division classic, Desperation A.M. played a smattering of gigs, in Ayr, Dundee and Edinburgh. Rather than give the band more scope the additional guitar upset the band dynamics to the extent that Mark got disillusioned with playing six-strings and opted to slink out of the splintering band to briefly take up bass duties with Little Big Dig who they shared a practice room with. The others went their separate ways, although Desperation A.M. were not actually finished ... merely dormant ... for quite some time.